Hicks searches through life’s difficulties to find the truth in God’s word in new book. I am convinced that if we have faith, and if we believe in God's character, then we can accept that God is who he says he is. Trust is often hard to come by when all the people around us seem to only care about their own agendas. In “Finding Freedom in God’s Promises,” author Beth Gable Hicks encourages readers to look deep within themselves and in the Scripture to find the meaning behind life. 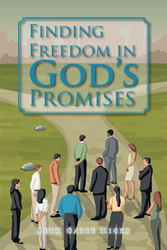 Hicks wants readers to understand and trust in what God’s promises actually are and find freedom from the all unpleasantness of the world in them. Hicks is a Christian author as well as a widow and found her happier, more meaningful self after meditating on God’s words. Hicks wants the reader to find renewed encouragement from her book and new faith in a faithful God. Beth Gable Hicks is a member of the Falls Church Anglican in Falls Church, Virginia, where she serves on the altar guild and pastoral care teams. A native Kentuckian, she was a political appointee during the administrations of President George H. Bush and President George W. Bush and is currently the East Coast lead for AllSides, Inc. She earned her BA in business administration from Vanderbilt University and her MPA from George Mason University and is an active member of the DC Daughters of the American Revolution.